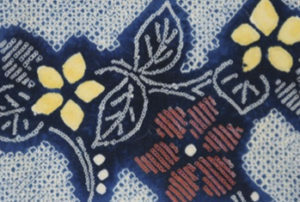 Traditional book cloth is beautiful, but it can be hard to obtain and is only available in limited colors and styles. 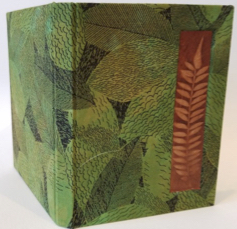 There might be times when you want to make a custom book cloth to match the theme of your book. This same process can be used for backing paper. Backed paper allows you to use more delicate papers for book covers and end sheets. We’ll also make a small portfolio book with your newly backed fabric. Please sign-up below and bring payment to Denise Cavanaugh. Cost: $20 for members, $25 for non-members, plus a $5 supply fee. High-quality, tight-weave cotton fabric. This is very important! Don’t buy cheap Hobby Lobby fabric for $1.99/yard. You’ll put a lot of work into this, so make sure it’s going to come out looking great! Decorative paper to match your fabric. This is a very small piece, no need for it to be larger than 10 x 10”. You can also bring a complimentary paper for the pocket that will go in your book. This paper should be about the same weight at Arches text wove. Feel free to paint it beforehand, but it must be dry when you bring it to class. This piece should be 8 x 12”, with the grain running the 12” side. If you don’t know what that means, just bring a piece 12 x 12” and we’ll make it work. Your kirigami book, if you made one. 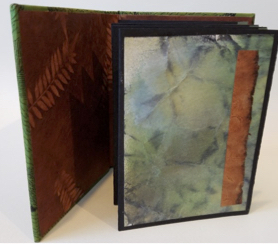 This portfolio book is designed to fit the Kirigami book. If you don’t have one, I’ll have portfolios for you to take home and fill later. 4mm jig, if you have one. If you don’t know what this is, don’t worry about it. Scalpel or x-acto with a sharp blade. Bring a lunch and drink. There are also several fast food restaurants close by. Call or email Beth if you have questions about the supplies.